Popular girl group member A and 'handsome sculpture' B met through a variety program and are said to have fallen in love. Known to be masculine and honest, B recently confessed to his friends over some drinks that A is now his girlfriend. B has surprised his friends with the type of girls he dated but it seems this time he's found his perfect match, with both parties lacking nothing in face, body, or talent. A perfect combination if there ever was one! .. now I want Hyunjoong and UEE to somehow confirm this dating scandal! I know there is such a slim chance that hyunjoong will ever make confirmation but I hope they will be 'caught'... I so want them to date now that there dramas are done, and be caught!!! 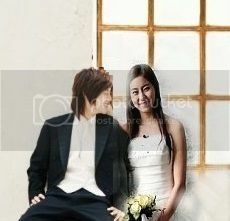 having fun in getting wedding pics of UEE and Hyunjoong!!! Kim Hyun Joong talked about the rumors of him dating After School's UEE! Back when both of them were starring on 'Barefoot Friends', a rumor had spread that the duo were actually dating. According to rumors, Kim Hyun Joong had introduced UEE to his friends as his girlfriend. Even though the rumors quieted after the show ended, it still pops up from time to time. In an interview he had with Star Today, he was asked about the rumors. He answered, "It's not true at all. To be honest, I trusted these rumors out of instinct. But now that I became one of the subjects, I realized they're not believable. I heard through the rumors that I was dating UEE, and we laughed together when we saw it. After that, the staff kept teasing us, so I jokingly said 'she's my girlfriend', and that became the fuel for another round of rumors. It's a scary world." He added, "We were all close during the filming, but I don't think I could ever be dating UEE like the rumors suggest." ha!Just a couple of days after I posted my wish of hyunjoong and Uee and now this article some out.... hahaha Jjang! and denial... denial... denial...I love you Hyunjoong but from what I learned regarding the latest SNSD dating scandals, if there are rumors, then there is like 90% possibility that it is for real!! !Idols or Korean celebs in general would deny everything dating rumors. well tthat is until 2 instances: first, they are caught, 2nd they are getting married. So my money is on that possibility that UEE really became his GF, but the question is, are they still dating...? And if they are... would they get caught? Hyunjoong would be going to the army soon and as much as I would love this couple to be real, I hope that whole dating thing would not be such a bigger deal than the projects he will have before he does his military service. 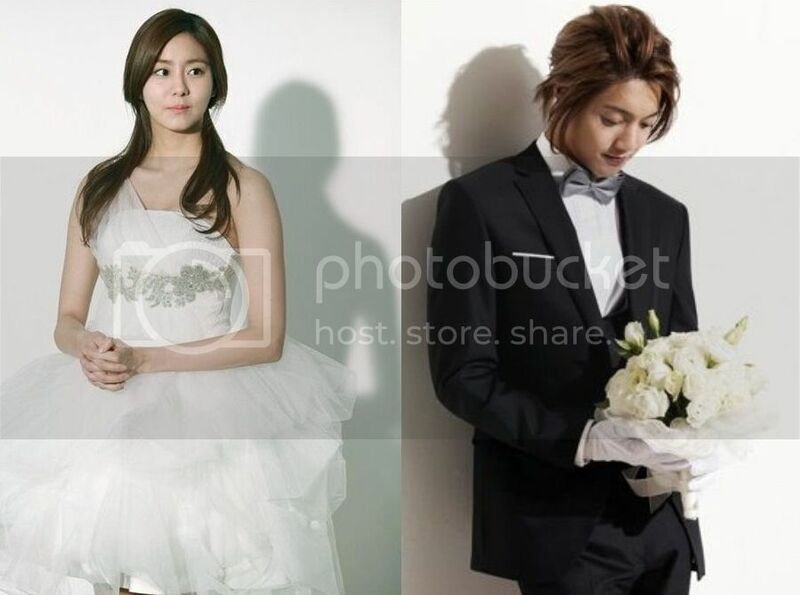 class="at_ttl" style="padding: 0px; margin: 0px; list-style: none; font-size: 30px; line-height: 35px; clear: both;"UEE and Kim Hyun Joong: Are They Dating? Kim Hyun Joong recently spoke up about the rumors that he and the After School singer and actress Uee were dating. The rumors have existed since the two appeared on "Barefooted Friends" together and fans commented on their behavior. Fans noticed that they mostly sat or stood next to each other and seemed very friendly. Rumors quickly spread that the singer and "Inspiring Generation" star had introduced Uee to his friends as his girlfriend. Fans also commented that when Uee's mom was on the show and had to choose the ideal guy for her daughter, the only candidate that seemed totally relaxed was Kim Hyun joong. It was almost as if he knew he would be chosen, they said. The couple first met in 2009 when they filmed a commercial together so they were already friends when the "Barefoot Friends" episodes began filming. But dating? He says they are not dating. And he says, the fact that people think they are dating makes him think less of rumors in general. "I always assumed that there must be some truth to rumors," he said in an interview with Star Today. "But now that I am the subject of rumors, I realize that they are not at all believable." Both Uee, who recently finished starring with Jung Il Woo in "Golden Rainbow," and Kim Hyun Joong laughed about the rumors. "We laughed together when we saw it," he recently said. "Afterward the staff kept teasing us, so I jokingly said that she was my girlfriend and that fueled another round of rumors. It's a scary world." The rumors calmed down after the show ended but they never completely died down, he said. And occasionally he still has to deny them. "It's not true at all," he said. "We were close during the filming, but I am not dating Uee like the rumors suggest." Kim Hyun Joong has managed to keep his dating life private. He did say a few years ago that he dated one girl for three years but they broke up. Uee was rumored to be dating her "Ojakgyo Brothers" co-star Joo Won. He confessed that he had feelings for her during the filming but that it never developed into a relationship. She has confessed to dating in the past but nothing is known about whom she dated. She once said that true love had not found her yet. But when it did, she was not sure she would go public with her relationship. NOW, I now get why shipping and getting some connections for SHIP by fans is so big. CAUSE it is so much fun... I am so giddy right now! UEE and Hyunjoong, how much I would giggle until heavens if you two are in a relationship or if they admit their relationship. reading some of their interviews just fuels my thoughts for this SHIP to sail to love and forevermore. and now I am one of those people/fans who will get them to connect no matter what, especially with the recent trend of idol dating scandals and which taught me a lesson: Idol dating scandal even when denied carries some truth in them. Twitter@AlienPrinceKHJ: HJ revealed that his view about women changed because of IG. "Previously, I had to meet women that I like first, but I like Kim Ok Ryeon in IG who only looks at me and treats me well. There's no reason to dislike (a woman who likes me & good to me)." Twitter@AlienPrinceKHJ: HJ: I like women with style like Ok Ryeon who's like a "puppy". I tend to feel intimidated by women who are too strong. Twitter@wangziqi: Khj likes girls who are like a puppy, would be scared if the girl is too strong. thinks seyeon is pretty, likes su hyang's personality. I feel like I am getting a little delusional but somehow their answers somehow click with each other... hahahaha! Anywhere here is a video of them! Popular female group After School's member Uee (21) talked about ˜Flower Boy Lee MinHo (22) and Kim HyunJoong (23) charms. Uee finished filming the omnibus styled Anycall CF with Lee MinHo and Kim HyunJoong earlier this month. Uee appeared for 2 out of the 3 minibus CF, as lover of Lee MinHo and Kim HyunJoong respectively, showing her naturally lively and cute image. Uee who had to undertake the role of commercial film model with topstar charismatic men was asked, Who is your ideal type between Lee MinHo and Kim HyunJoong and she compared each of their charms, Lee MinHo is an oppa who is meticulous and takes good care of others. Kim HyunJoong has a peaceful charm while being blunt. And said her afterthoughts on the filming, Though they have opposite image from each other, both of them are very charming/attractive. UEE's mother picked fellow 'Barefoot Friends' cast member Kim Hyun Joong as the best husband for her daughter on the latest episode of the travel variety program (although, to be quite honest, is anyone surprised?). As the cast members gathered in one place with UEE's mother prior to departure, she was asked to choose the most well-suited husband for her beautiful daughter from the roster of cast members. Although she held some reservations - "he doesn't look the brightest" - she still picked Kim Hyun Joong as the one who would make the best potential suitor. After School's UEE Changes Her Ideal Type To Kim Hyun Joong? UEE jokingly changed up her ideal type on SBS' "Barefoot Friends" to Kim Hyun Joong.During the May 12th episode, the cast ventured off to Indonesia to complete various tasks. One of those tasks was working in the fruit market and Kim Hyun Joong ended up with the most money.Afterwards, the others tried to win him over with praises. UEE on the other hand praised him in a way the others couldn't as the lone female cast member...she stated, "I don't know if this is okay to say...But my ideal type changed after I started 'Barefoot Friends' to Hyun Joong-oppa!" instantly winning him over and...the bills, making everyone burst out laughing.